Blue Grass doesn’t just have the best quality plants, landscaping products, and gardening accessories, we also offer the expertise, equipment, and services to get the job done right. We understand that you might not always know what you need for a job until you get there. That’s why we have a variety of equipment and products available to help you get your job done on time and on budget. Call our team today to help guide you into ordering the right products and services for your needs. Our expert services save you the time (and headache) of having to finish your project all on your own. 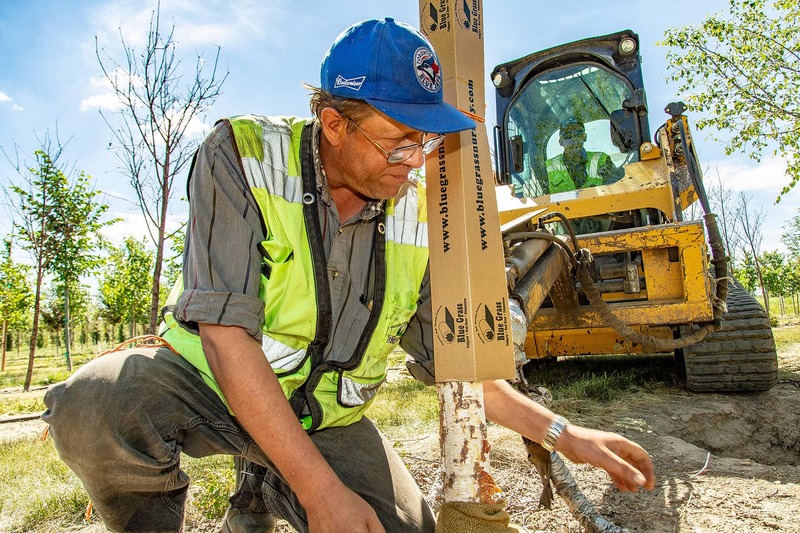 Our top-of-the-line equipment (combined with our skilled operators) can help you get the job done quickly and easily. Already Know What You Need? Call Us. Blue Grass Nursery and Garden Centre provides planting services for any trees purchased from Blue Grass. 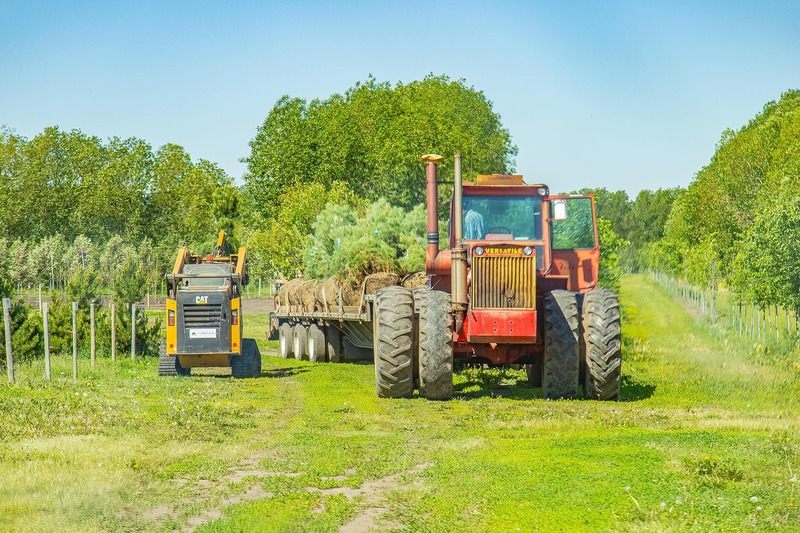 We offer full-service planting, which includes delivering the trees, digging the hole, planting the tree with appropriate supplied soils, fertilizers and additives, and backfilling around the tree. We also clean up after the job is complete by taking away any leftover soils and debris. Blue Grass does require all utility locations marked prior to any digging or planting. Blue Grass Garden Centre specializes in stunning custom-made seasonal planters. Bring us your container and colour preferences and we can create a custom, one-of-a-kind planter that will add some spectacular colour to your property and wow your neighbours. Blue Grass offers sod installation for large projects like parks, acreages, schools, and soccer and baseball fields. We have big roll sod available in 360 square foot rolls (40 square yards), which must be laid with a skid-steer and sod attachment or a sod laying machine. Blue Grass has loaders, bobcats, and dump trucks available for all your snow removal needs. Blue Grass has the equipment needed to screen up to 1,000 cubic yards of custom soil mixes per day. Blue Grass has a number of water trucks that can be hired to perform watering duties like watering trees, shrubs and sod, road dust control, cleaning parking lots, etc. If you're looking for a service that Blue Grass doesn't provide, we would be happy to refer you to a qualified landscape contractor that can help you out. Blue Grass provides a first-class delivery service within Calgary, Red Deer, Edmonton and surrounding areas. Deliveries for sod, soils, rock, and trees can be arranged with a couple days’ notice. We have various different methods of delivering products to our customers, so get in touch today to learn more about our options. Sod is delivered via flat deck semi-trailers and a forklift, to place your product wherever you desire, providing there is access for the forklift and the driver feels it’s safe to place where specified. All sod is to be laid within 24 hours of delivery. Our easy and convenient Handy Cube is delivered by flat deck semi and placed by semi-trailers wherever you desire, with appropriate access. There is no deposit on the Handy Cube bag, but bags can be returned to Blue Grass or put into your blue bin for recycling. Bulk premium soils, mulch, landscaping rock, sand, gravel, decorative rocks and more are delivered in dump trucks that can carry up to 12 cubic yards, depending on product. Bulk products can be delivered in any quantities starting at 1/2 a cubic yard. Blue Grass also has larger pieces of equipment to deliver larger quantities. Ask us for a quote. Trees are delivered using a crane truck that has a reach of up to 30 feet. Specialized tree dollies can also be used to move trees to locations that have no crane access. For larger volumes of trees, we also deliver on flat deck semi-trailers. We have a wide variety of equipment required for all projects, and while we don't rent equipment, it can all be hired hourly to help you complete your projects. Call us today for a quote on price and availability. We offer all the machinery needed for harvesting, installing and delivering sod. 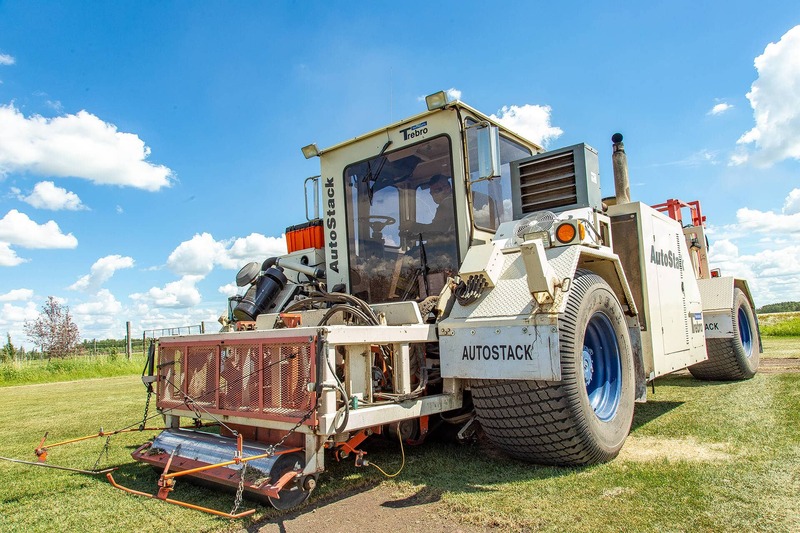 We offer machinery to screen top soil and special blended soils that has been designed to blend soils and remove large debris. We process birch and pine logs into premium firewood year-round, available for pick up or delivery on small to large amounts. Our automated firewood processor allows wood logs to be cut and split to any size.